Bessie Head, one of Africa’s most prominent writers, was born in South Africa in 1937. The child of an “illicit” union between a Scottish woman and a black man, Head was taken from her mother at birth and raised in a foster home until the age of thirteen (see Apartheid). Head then attended missionary school and eventually became a teacher. Abandoning teaching after only a few years, Head began writing for the Golden City Post. In 1964, personal problems led her to take up a teaching post in Botswana, where Head remained in “refugee” status for fifteen years before gaining citizenship. 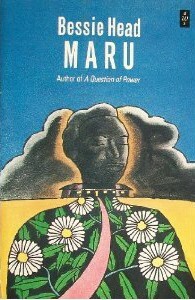 All three of her major novels, When Rain Clouds Gather, Maru, and A Question of Power, along with others, were written in Botswana during this period. Bessie Head died in Botswana in 1986 at the young age of forty-nine. The writings of Head cover many aspects of her personal experiences as a racially mixed person, growing up without a family in South Africa. Her works deal with issues of discrimination, refugees, racialism, African history, poverty, and interpersonal relationships (see Apartheid Literature). A hint of autobiography is present in much of Head’s writing, which often deals with poor and emotionally abused black women dealing with both racist and sexist discrimination. Head’s variety of characters are both young and old, male and female: this variety allows her to approach the same themes from different perspectives, but the focus is always on the struggles and hardships of life in postcolonial Africa. Everything is at a beginning. No colonial power ever intended planning for black majority populations. Libraries, schools, and planning for people was provided after independence. It could be said that a reading tradition was absent in the society (personal journal, 1985). While recognizing the lack of access to education for native Africans, Head claimed to be freed of such oppression by the missionaries who raised her. In their care, she was educated as a child and given access to large libraries. Head also claimed that despite its status as an ex-British protectorate, South Africa retained its people and culture, which provided her with a sense of identity and security. “Here you have ancient Africa almost intact but with many subtle blendings of everything new that was introduced to the people over the centuries. I have drawn on this depth and stability as a writer” (personal journal 1985). Although she claimed to be vehemently non-political in her actions, Head’s writings dwell on injustice and oppression in the political arena in South Africa, and her hopes for social change and peace in the future. “It is impossible to guess how the revolution will come one day in South Africa. But in a world where all ordinary people are insisting on their rights, it is inevitable. It is hoped that great leaders will arise there who remember the suffering of racial hatred and out of it formulate a common language of love for all people” (personal journal 1985) (see Representation). See also Postcolonial Novel, Gender and Nation, Third World and Third World Women. Head, Bessie. A Question of Power. London: Longman, 2009. —. A Bewitched Crossroad. Saint Paul: Paragon House, 1986. —. The Cardinals. London: Heinemann, 1993. —. Collector of Treasures and Other Botswana Village Stories (a collection of 13 short stories concerning human treasures). London: Longman, 2008. —.A Gesture of Belonging: Letters from Bessie Head 1965-1979. ed. Randolph Vigne. London: South Africa Writers; Portsmouth, New Hampshire: Heinemann, 1991. —. Maru. Oxford: Heinemann Educational, 1971. —.”The Prisoner Who Wore Glasses”. The Heinemann Book Of South African Short Stories. Ed. Denis Hirson, Martin Trump. London: Heinemann, 1994. 202-207. —. Serowe: Village of the Rain Wind (a non-fiction work of the history and myths of Serowe). Oxford: Heinemann Educational, 1981. —. When Rain Clouds Gather. Oxford: Heinemann Educational, 1995. —A Woman Alone: Autobiographical Writings. London: Heinemann, 1990. Abrahams, Cecil. The Tragic Life — Bessie Head and Literature in South Africa. Trenton: Africa World Press, 1990. Brown, Caroline. ”A Divine Madness: The Secret Language of Trauma in the Novels of Bessie Head and Calixthe Beyala”. Comparative Studies of South Asia, Africa and the Middle East. 28: 1 (2008) 93-108. Gohrbandt, Detlev Kunapipi. ”Embracing the Alien Inside: Bessie Head and the Divided Self”. Journal of Postcolonial Writing, 29:1 (2007) 108-20. Ibrahim, Huma. Bessie Head — Subversive Identities in Exile. Charlottesville: University of Virginia Press, 1996. Mackenzie, Craig and Woeber, Catherine. Bessie Head. Toronto: Cengage Gale, 1998. Pucherova, Dobrota. “A Romance That Failed: Bessie Head and Black Nationalism in 1960s South Africa”. Research in African Literatures, 42:2 (Summer 2011) 105-124. Rafapa, L. J. ”Instances of Bessie Head’s Distinctive Feminism, Womanism and Africanness in Her Novels”. Tydskrif vir Letterkunde, 48:2 (Spring 2011) 112-121.